“Willow Weep For Me” was written by a Radcliffe student named Ann Ronell. She encountered some initial trouble in getting the song published, but once Irving Berlin decided to publish the song, it began to take off. 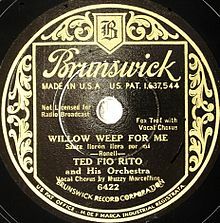 The first recording was made by Ted Fio Rito, with vocals by Muzzy Marcellino. The song became a jazz standard and has been recorded by many fine jazz artists, including Art Tatum, Dinah Washington, Stan Kenton, Thelonius Monk, Ella Fitzgerald and Billie Holiday. “Willow Weep For Me” was recorded in June 1996 and released in 1997 on the album Tony Bennett On Holiday. It was arranged by Jorge Calandrelli.